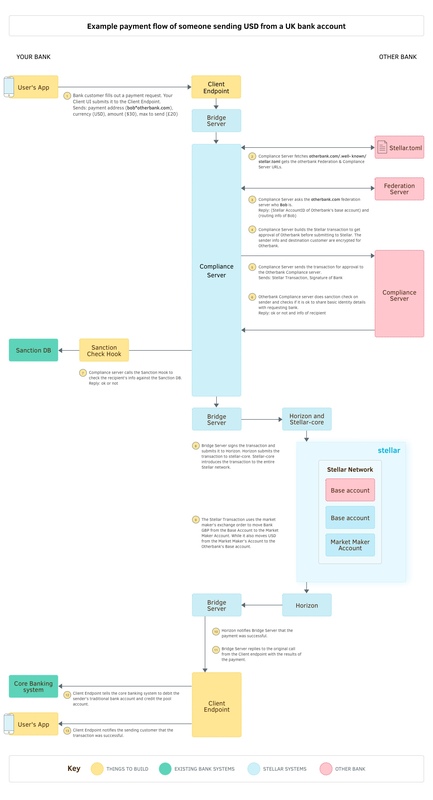 Learn on How the Stellar Network Operates to get an overview of the technology and follow the path of a payment. 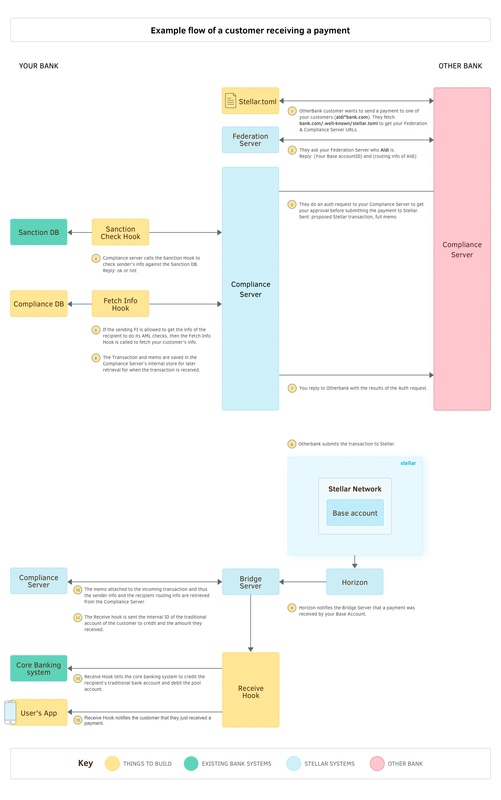 Learn what, exactly, a decentralized network is and read brief explanations of Stellar concepts such as consensus, trust, and credit. We refer to the technical process of connecting to Stellar as integration. In general terms, integration means configuring your systems to talk to the Stellar network. The Stellar integration process is relatively straightforward. First, identify the use case that is most appropriate for your business. Next, your technical team will set up database tables, write code to listen to the Stellar ledger, conduct transactions, and test your integration. Stellar offers software, tools, and documentation to assist the technical side of the integration process. All of the software necessary for integration is licensed under the Apache License, version 2.0. This license permits commercial use, modification, and/or distribution. Integrators will need to dedicate technical resources to integrating with Stellar. It typically takes between 120-200 hours of technical development, depending on the size and experience level of your developer team. There are no restrictions on any commercial use of the Stellar network. Please see Start-Up Costs and Integration Fees above for information on our open software license. Stellar.org operates as a non-stock nonprofit organization. Our mission is to connect people to low-cost financial services to fight poverty and maximize individual potential. To that end, we don’t charge people or institutions for use of the Stellar network. 5% of the initial lumens are set aside for operational costs. Stellar.org accepts tax-deductible donations from the public. We received an initial infusion of funding from the payments startup Stripe. Our corporate donors include BlackRock, Google.org, and FastForward. The Stellar network refers to the technology that processes financial transactions. The technology is open source, distributed, and community owned. Stellar.org is the nonprofit organization that contributes to the development of tools and social good initiatives around the Stellar network and financial inclusion. Employees contribute code to the Stellar network, but the technology is independent of the organization. An API is simply a set of tools and building blocks for creating software applications. Horizon is a RESTful API that allows you to submit transactions to the network, check the status of accounts, and subscribe to event streams. The distributed Stellar network is made up of servers running the Stellar Core software. These servers are maintained by different individuals and entities. Stellar Core maintains a local copy of the network ledger, communicating and staying in sync with other instances of Stellar Core on the network. A transaction on the network consists of one or more operations. Payments, offers, and fees are all examples of operations that could make up a single transaction. Depending on hardware and network configurations, a conservative estimate of Stellar’s processing rate is 200 operations per second. There’s a nominal fee, referred to as a base fee, associated with each operation in a transaction. The base fee functions as a deterrent: Though nominal, it discourages users with malicious intentions from flooding the network with transactions (otherwise known as a DoS attack). While transactions are irreversible on the Stellar network, it is possible to freeze the assets you issue. Freezing an asset renders the asset valueless to the user, ensuring that it can only be sent back to you. For example, let’s say you accidentally credited the wrong customer account with ₦200. You can simply freeze those naira, preventing the customer from spending any mistakenly sent funds. Freezing an asset is a simple operation that takes effect within 3-5 seconds. The Stellar network mitigates risk through a decentralized and distributed structure. If Stellar.org were to disappear, the network would continue to confirm transactions, and anchors could still integrate with the network at any time. All Stellar Core validators are run by community members external to Stellar.org. Stellar.org runs a pair of non-validating read replicas and archives history to our own Amazon S3 buckets. Stellar is software—think of it as the middleware that sits between financial products and institutions. As such, we are not a licensed financial institution. If your organization plans to accept deposits and issue credits on the Stellar network, it is likely you will need to be a licensed money services provider (MSP) or mobile money operator (MMO). All integrators should heed the regulatory environment of their organization. Integrators are responsible for implementing all KYC/AML identity verification requirements. However, Stellar has produced tools to help financial institutions with their integrations. Integrators may find the compliance protocol helpful. All transactions on the network are public. With third-party tools like Lightning, private transactions are possible. Consult your technical team on whether such tools would work for your implementation. Our recommended design is to use at least two Stellar accounts: a base account and an issuing account. Issuing accounts can serve as the intermediary pool between the base account and customer’s accounts. A base account’s credentials should be kept on a computer that is not connected to the Internet and cannot be compromised. Ensure that all of your assets are marked AUTHORIZATION REVOCABLE so you can freeze them in an erroneous situation. Advise technical teams to follow the configuration recommendations outlined in the developer documentation. Though transactions require an Internet connection at the moment, tools for low-bandwidth environments are in development. The more confident with stellar..stellar is the best .. Instead of solely focusing on the coins. Why not have some more (easy to find and use) how to's on using the forums. (16-02-2017, 02:12 PM)BillyNomates Wrote: Instead of solely focusing on the coins. Why not have some more (easy to find and use) how to's on using the forums. thats great idea, but isnt this is the purpose of this forum? building community? what the hell, to ADMIN?!!! why posting needs to wait 350seconds? I think the reward is not related to the interval timing between posting. Neither shortening the timing nor reducing the reward will result in a better post quality. So the waiting time should be removed imo. (13-04-2017, 04:52 AM)cy2017 Wrote: I think the reward is not related to the interval timing between posting. Neither shortening the timing nor reducing the reward will result in a better post quality. So the waiting time should be removed imo. this is very usefull for me thanks for your sharing. This stuff is awesome. I can't believe it took me this long to find out about Stellar. I cannot wait to see what lies ahead. I will be doing my best to spread the word. What is it specifically that makes this form of payment different from say, the other coins and blcok chains available under the same relative tech? I am new so please excuse me if I'm asking a dumb question. (27-04-2017, 02:11 PM)Tdiv7653 Wrote: What is it specifically that makes this form of payment different from say, the other coins and blcok chains available under the same relative tech? I am new so please excuse me if I'm asking a dumb question. I wanna to create a stellar account but I do not know how to activate the account after i gonna send the minimal 20 str, who can help me? I'm still understanding Stellar and this thread is a great read. Thanks it explains it nicely. I find this coin interesting. I think the reward is not related to the interval timing between posting. You are really so lucky. You got 2 btc amount from stellars. Where did you got that 100$ trading bonus? I hope I also receive some lumens from the give away. In my opinion after reading this post. It is more valuable crypto than any like btc. I think that you should create more focused (detailed) posts instead of one big post that explain nothing interesting.